Hi lovelies! 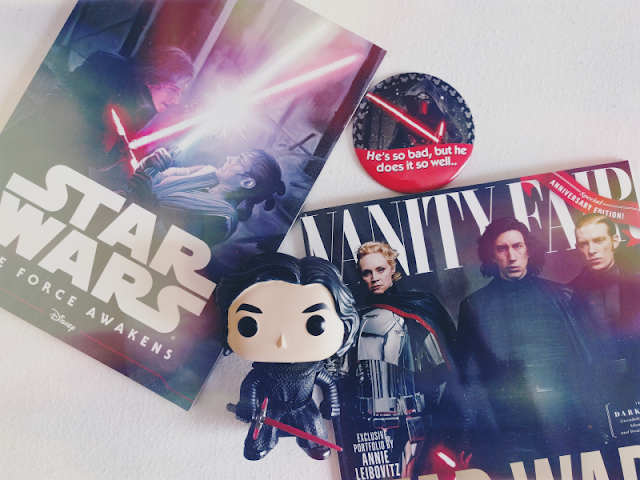 I was recently flicking through the recent Vanity Fair issue that had a feature on the upcoming Last Jedi film and I was just overwhelmed with my love for Kylo Ren (y'know... As you do...). I know there's a lot of people who aren't the biggest fan of him so I thought I'd write a post where I attempt to explain why I think he's such a brilliant character in the hope I can convert a few of you! Just a warning - this post will contain spoilers for The Force Awakens so proceed with caution! I mean, let's get the obvious out of the way first right? When he takes his helmet off in The Force Awakens, OH MY GOSH. That hair though. I spoke to someone on Instagram who said she audibly gasped in the cinema at that bit and girl, YES. Whether it's Disney, Star Wars or any other franchise, I've never really been a fan of villains so it took me by surprise when I came out of the cinema loving Kylo! I think this is because he's not the usual villain as he is conflicted about which path he should take, between the dark side and the light. Combined with his emotional instability, I think this makes him a much more interesting and realistic villain than ones that are 100% villainous as you're never really sure what he'll do or how he'll react and I'm looking forward to seeing how this plays out in the next two films. There's a lot of examples I could give here but my favourite has to be the scene in the forest towards the end where he purposely smacks the injury in his side from Chewbacca, acting like it's totally no biggie that he's just been shot and is casually bleeding all over the place. From his awesome-as-hell crossguard lightsaber, to the design of his ship and costume, everything about Kylo's concept is so aesthetically pleasing. It also reflects his personality brilliantly, such as the serrated edges on his lightsaber which are due to the crystal inside that powers it being incredibly powerful yet unstable. So there we are... That's why I'm hopelessly in love with Kylo Ren haha. I'm so excited to find out more about his background in the upcoming films and to see how much he lets himself be cosumed by the dark side. I hope I've at least convinced anyone who wasn't previously a fan of him just a little bit of how great a character is!